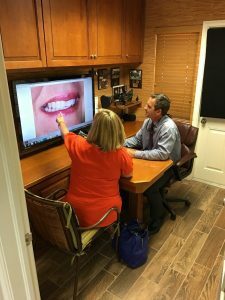 There has been much advancement in dentistry over the past twenty years, and keeping abreast with dental technology is one of Dr. Hagood’s passions. In addition to the care, skill, and knowledge needed to produce world-class dentistry, having the latest technological tools is a necessity. We are committed to providing the latest in technological advancements for our patients. Here are just some of the technologies we use. Dr. Johnson Hagood prefers the microscopic technology from Designs for Vision. The precision optical research and manufacturing done by Designs for Vision is among the most sophisticated in the world. Dr. Hagood utilizes the latest digital dental technology from Schick. Thanks to this new dental technology, we can take x-rays with up to 90% less radiation than from older conventional equipment and generate images that are superior to conventional x-ray film. Patients enjoy the efficiency, comfort, and safety. Patients can view their digital radiographs on the computer monitor as we discuss findings. From the clinical standpoint, retrievability and portability are greatly enhanced. Your digital x-rays can be emailed to the office of any clinician who is collaborating with Dr. Hagood, for example, an orthodontist, periodontist, or oral surgeon. Plus, digital x-rays are environmentally safe; they require no developing solutions, fixers, cleansers, or x-ray mounts. One of our most important dental tools has become the digital camera. Dr. Hagood prefers the Nikon D200 which boasts a 10.2 megapixel DX Format CCD image sensor and yields extraordinarily high-resolution images. Paired with a high magnification macro lens, the images are used for diagnosis, patient communication, treatment planning, treatment confirmation, shade matching, imaging, and lecture purposes. We have hundreds of before and after images to view of nearly every type of dental procedure. All images on this website were taken with our Nikon digital camera. Another highly technical digital dental tool used by Dr. Hagood and the hygiene department is the intra-oral digital video camera from Schick. The tiny device is a video camera that moves around inside the mouth and generates a tooth by tooth video exam. The images can be stored and later enlarged and printed. As it is difficult to see inside your mouth, the intra-oral camera provides a previously unseen magnified view. The pen-sized camera features a disposable cover to prevent contamination and is completely safe and painless to use. As the camera moves around the mouth, it sends video images to a computer which is then displayed on a monitor. The images can then be viewed by both the doctor and patient. Using the intra-oral camera allows the patient to better understand their needs by seeing what the dentist sees, while having it explained. For more information about our high technology intra-oral cameras, you may visit www.schicktech.com. One of our newest and most exciting technologies is the T-Scan Computerized occlusal analysis system. With T-Scan technology, Dr. Hagood accurately documents how your teeth come together, the points of contact, which points make contact first, and the forces that occur. Human joints have surfaces which rub together in function. Smooth, well lubricated surfaces in a proper biomechanical relationship produce little friction and little vibration. But surface changes, such as those caused by degeneration, tears, or displacements of the disk, generally produce friction and vibration. Different disorders can produce different vibration patterns or “signatures”. Analysis of a Joint Vibration Recording (JVR) identifies these patterns and helps Dr. Hagood distinguish among various TMJ disorders. A JVA recording is painless and takes only a few moments. 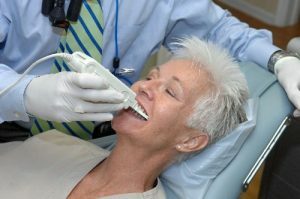 The JVR diagnostic tool provides Dr. Hagood a fast, non-invasive, and repeatable measurement of TMJ function to aid in your diagnosis of TMJ function. Listening to your jaw joints is an important step in the TMJ-Occlusal exam process. A doppler is basically a stethoscope with a microphone that incorporates the Doppler wave effect. (This technology is also used to listen a baby’s heartbeat in the womb.) Dr. Hagood will place the stethoscope at each joint and listen to the sounds of your jaw joint movements. From the sounds, he can assess the amount of friction and quality of lubrication within each joint. Dr. Hagood uses the Picasso soft tissue dental laser to perform a variety of soft tissue procedures, such as opening and shaping gum tissue. Laser technology minimizes tissue damage. It also minimizes bleeding and the risk of infection because the high-energy light beam aids in blood coagulation and sterilizes the surgical area. Most patients do not experience post-operative pain because nerve endings are sealed and swelling is lighter than if a scalpel is used. Dr. Hagood uses an MLS cold laser (a low-level energy laser) as a therapeutic tool to treat TMJ and facial muscle pain. The laser’s light energy penetrates deep into inflamed muscles and the temporomandibular joints to reduce inflammation and associated pain. As the light wand is passed over the skin, you will feel a comfortable warming sensation. Dr. Hagood uses lightweight and relatively quiet NSK electric handpieces for removing and polishing tooth enamel and shaping dental restorations. The smaller, slimmer design of these “dental drills” makes them more ergonomic than traditional handpieces and better supports the precision and efficiency of Dr. Hagood’s work. The lighter touch of this type of drill works exceedingly well with today’s dental ceramics, lending to their durability and exquisite appearance, even on the microscopic level. Note: Dr. Hagood is exceptionally skilled in the usage of our technology. Your safety and comfort are our priorities. If you have questions or concerns about the technology we utilize, we’ll be happy to share more information with you.